It’s urgent to create consciousness for peace and disarmament. But it is also necessary to awaken a consciousness of nonviolence that rejects not only physical violence, but all forms of violence: economic, racial, psychological, religious, sexual, etc. This new sensibility could take root and inspire the social structures, opening the way towards the future Universal Human Nation. The World March for Peace and Nonviolence is already inspiring various initiatives and activities, and these will multiply in the coming months. One will be the symbolic march of an international and intercultural team whose journey will pass through six continents. 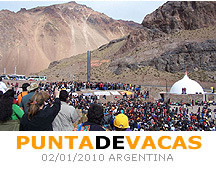 It will start on October 2, 2009 -- the International Day of Nonviolence -- in Wellington, New Zealand, and will culminate on January 2, 2010 at the foot of Mount Aconcagua in Punta de Vacas, Argentina. During this time, in hundreds of cities around the world, there will be marches, festivals, forums, conferences, and other events to create consciousness of the urgent need for Peace and Nonviolence. And throughout the world, the campaigns to gather endorsements for the March will multiply this signal beyond what is now imaginable. For the first time in history an event of this magnitude is being set in motion through the initiative of the people. The true strength of the World March is born from the simple, conscious act of those who endorse this dignified cause and share it with others.